The revolutionary transport solution extends intelligent monitoring to out-of-hospital transport settings such as ambulances, helicopters, and civic flights. SHENZHEN, China, Jan. 15, 2018 /PRNewswire/ — Mindray, a global medical equipment solution provider, announced the release of BeneVision N1 Patient Monitor. Designed for the varying demands of both intra and out-of-hospital patient transport, BeneVision N1 provides a steadfast and versatile solution that integrates seamlessly into the BeneVision Patient Monitoring Solution with maximum mobility, patient-centric data continuity and streamlined workflow. In compliance with out-of-hospital patient transport standards such as EN1789, EN13718-1, IEC60601-1-12 and U.S. military standards, N1 is a highly competent solution for various out-of-hospital transport settings both on land and in air. BeneVision N1 combines state-of-the-art design, innovative technology with a clinically tested ease-of-use workflow, all while maintaining patient data continuity. Weighing less than 1kg, the palm-sized monitor provides clear viewing from all angles with HD display touchscreen and streamlined workflow with intuitive operation. With Platinum Multi-parameter Platform, BeneVision N1’s enhanced data analysis greatly improves parameters’ accuracy and anti-interference ability. Its fully integrated sidestream CO2 module monitors the patient’s breathing situation by connecting with sampling line directly, saving the shackles of expanding external modules for transport. BeneVision N1 adapts to the clinical needs across the hospital from a plug-and-play module, to transport, to a stand-alone bedside monitor. It can be connected into BeneVision N-Series bedside monitor as a module or function as an independent bedside monitor. The connectivity capabilities of BeneVision N1 enables it to follow a patient throughout the entire care process, ensuring data continuity for patient-centric monitoring, thereby improving overall information management efficiency. Integrating Mindray’s latest monitoring technological innovations to address clinical needs, BeneVision N1 is designed to provide caregivers and hospitals with more value and efficiency. 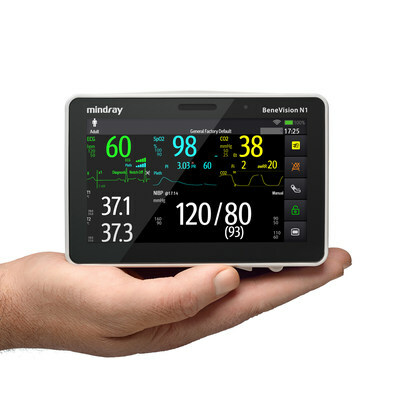 With its release, Mindray is set to continue the pioneering position in patient transport monitoring solutions and proven success of its previous BeneView T1 transport monitor which has been widely acknowledged in the market. Mindray is a leading global medical solution provider, dedicated to making better healthcare more accessible to humanity. Since its foundation in 1991, Mindray has been focused on the medical industry in the fields of Patient Monitoring & Life Support, In-Vitro Diagnostics, and Medical Imaging.